“How’s the market?” is the one question that Windermere Agents get asked most. It is the same question we ask when we meet an agent from another state. It’s a simple question with a very complex answer. Windermere Powerhouse Group knows how important it is to understand our real estate market and how curious everyone is to know what is going on in our community. So we created a market snapshot and a detailed report for every area of the Treasure Valley that will be posted monthly here on our Blog. 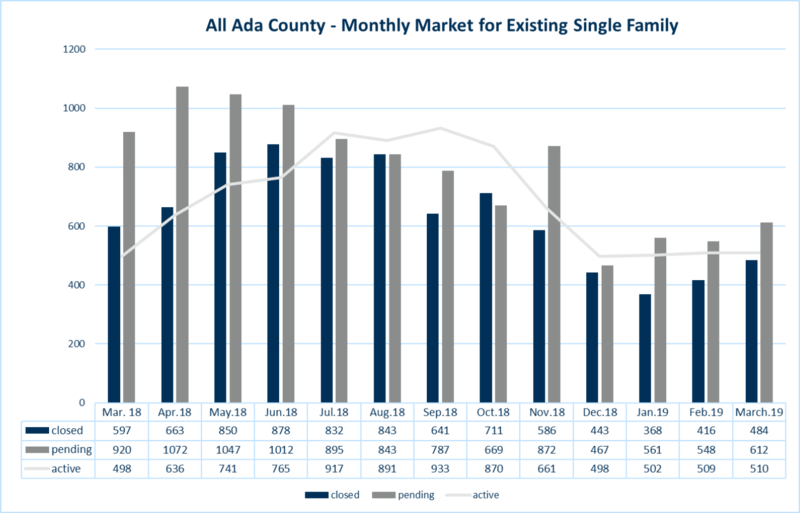 This month we are featuring Ada County Existing Home Sales (i.e., greater than 1 year old). Links for other areas and detailed reports are below. 1. Spring and summer are historically the seasons when market activity increases. More homes are available for sale, and under the current market dynamics, demand immediately follows. Total Year-to-Date (YTD) 2019 transactions are down from 2018, and the shortage of supply is a major contributor. As you’ll see below, overall prices continue to increase yet days-on-market remain at historically low levels. If you are interested in buying or selling your house now is the perfect time to take action. 2. Existing home prices have risen every year since 2011 and have taken a substantial increase in the last several years. 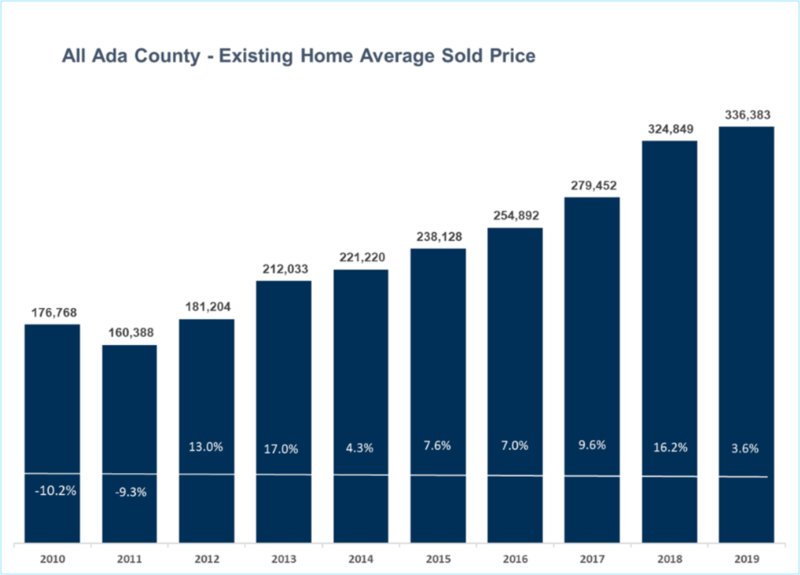 Average prices for Ada County existing homes have continued to climb in 2019, currently up 3.6%. Windermere Real Estate’s in-house economist, Matthew Gardner, forecasts 2019 Home Price growth to be 4.5% nationally, 8.9% in Ada County and 8.1% in Canyon County. So it’s actually a safe time to buy or sell a home too. Gardner forecasts the number of Ada County households to increase by 11.1% over five years, while Canyon County by 13.3% growth. 3. Last March, nearly half the existing Ada County homes that sold closed “At” or “Above” the original asking price. However, that trend varies greatly throughout the Treasure Valley. The graphs above show a snapshot of the Ada County averages compared to the North End and Boise Bench. There are numerous factors affecting a home’s price, and it’s evident that overpriced houses cost their sellers 2-3 mortgage payments last month. Specific neighborhoods have their own unique characteristics, and the REALTORS® at Windermere Powerhouse Group each possess the expertise and data to lead your next real estate transaction. If you’d like more detailed information, have interest in learning more or would like a thorough valuation of your current home, we’d love to hear from you. Top 5 things your brokerage should do for you. Your broker should care about you and your career goals, not just on your anniversary. Does your broker know who you regardless of your production level? Whether you are doing well or struggling, your broker should be there to help. Our broker is not only a seasoned agent, but a former IREC employee who is a consultant to other brokers. Tanya is the broker you want in your corner. Be available WHEN deals are happening, on the phone and in the office. If not, find a broker that will be there! Our broker is familiar with every transaction, and knows all of our agents. Provide individualized coaching and education opportunities. Never stop learning with agent groups, regular classes, free CE classes, and CORE classes offered in our in-house real estate school. We bring in local and national experts to teach classes, many of which are free for our agents. We also offer a 4-step onboarding plan to ensure your success. Gives you a great space to work. An amazing space that lends itself to collaboration and fosters rapport between agents, as well as a great place to entertain clients that you can be proud of. Our space is historic on the outside, yet is an innovative start-up at heart, with cutting edge systems to support you. Vibe. Everyone says they have a great culture, but do they have a great vibe? Does the staff know your name? Do the other agents? Find a place where you feel connected and inspired – our vibe eats their culture for breakfast! If you are feeling stuck at your current brokerage, let’s talk! 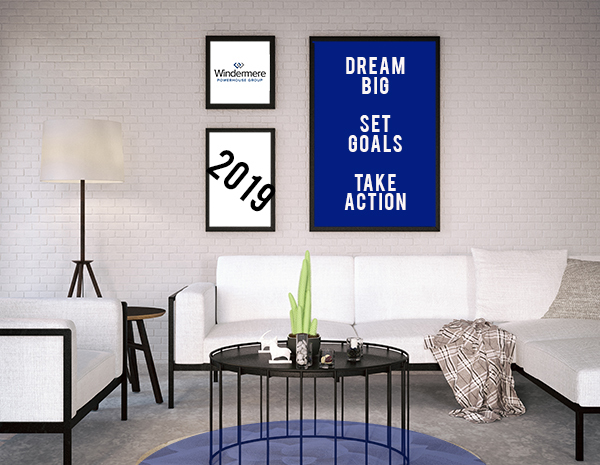 Here at the Windermere Powerhouse Group, we are big enough to offer you a regional presence and connections along with a 46-year history to leverage, yet small enough to feel like a boutique firm where it feels like family. We have a genuine culture of collaboration where you are immersed in a positive environment that fosters a feeling of community and success. Click here to schedule an office tour today! Top 5 tips for success! Are you the waterboy or the quarterback? Write down your dreams and goals. Be specific and develop a plan to reach them. Do you get one-on-one coaching with your Broker to guide your career development and help you achieve those goals? We help you development a plan that is ready to execute, yet nimble enough to shift as the market changes with regular updates. Take action. Goals are nothing without action. Get started today. We offer annual business planning, sales and marketing coaching and planning, and create a budget with you that includes a plan to execute. We have integrated software tools to help you track your efforts and create your marketing materials. You have an entire team to guide and support you every step of the way as you climb the ladder to success. Be honest, dependable, and take responsibility, otherwise none of these will matter. We offer group resources and support to help keep you on track and accountable – benefits of being a part of group without having to be on a team. Our agents are able to have focused careers, yet lead balanced lives. How you think is everything. Think success, not failure, as your life tends to go wherever the focus leads. Gain the mental discipline, focus, lead-generation techniques, and relationship-building skills that are designed to get the best results. Through individualized meetings, complimentary classes, and our proprietary systems, we help you grow your business. Don’t be afraid to innovate and be different. Following the herd is a fast track to mediocrity. If you are feeling like just another number, you probably are. From the moment you walk through our doors, you will see and feel the difference in our way of thinking. We offer tools and resources to keep you on the cutting edge of the industry. If you are feeling stuck at your current brokerage, let’s talk! We have an amazing culture of collaboration where you will be surrounded by a positive environment that fosters a sense of community and success, as well as a space you can be proud to bring clients. Click here to schedule an office tour today!